Any tour of Florence needs to be carefully planned; it’s not the city’s size or the difficulty getting around that’s the problem, but the sheer volume of attractions. Every street corner has some significant building, each piazza is full of history and all the churches have memorable pieces of art to enjoy. A visitor is never far from something interesting to look at, marvel over or photograph. 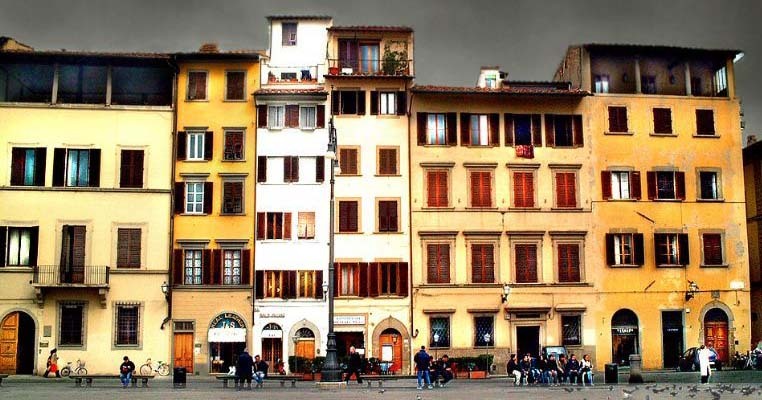 Some of the greatest places to visit and take in the Florentine culture are its many piazzas. Invariably, these are home to vast collections of impressive art, historical events and simple surprises. If you find yourself in need of a break on your hectic tour schedule, they are also just great places to sit and relax, take in the atmosphere and have a cappuccino. 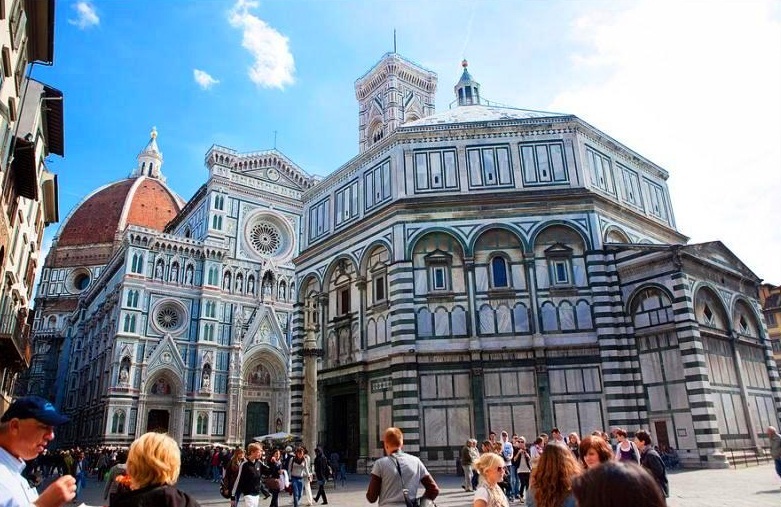 1) Piazzas Giovanni and Duomo are Florence’s spiritual centre. Here you will find the iconic Florentine images of Brunelleschi’s dome and Giotto’s bell tower, two greats of the Renaissance period. There are also the beautiful bronze doors that adorn the Baptistery credited with starting the whole movement in 1401. It was here that a competition was held to design the doors, Donetello and Brunelleschi entered but it was Ghilberti’s designs that heralded in the new age. 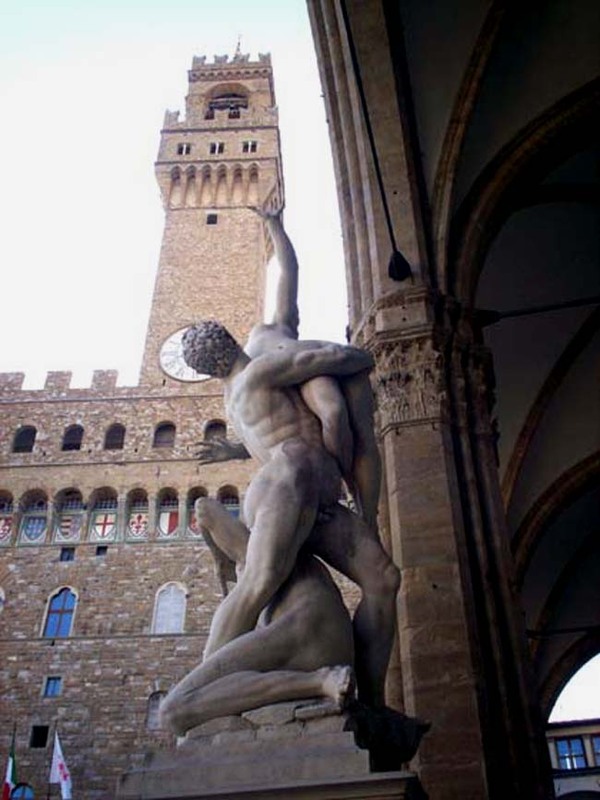 2) Piazza della Signoria represents Florence’s artistic heart, this is where the ruling class held their public ceremonies, debated and displayed their wealth. This piazza overflows with Renaissance creativity, from the Loggia della Signoria, the Palazza Vecchio and the Uffizi statues, frescoes and paintings are everywhere. The copy of Michelangelo’s David, the huge and ungainly Neptune fountain and Dontello’s mythical renderings of Marzocco, Judith and Holofernes. A student of art could spend a week alone here and still not discover all it has to offer. 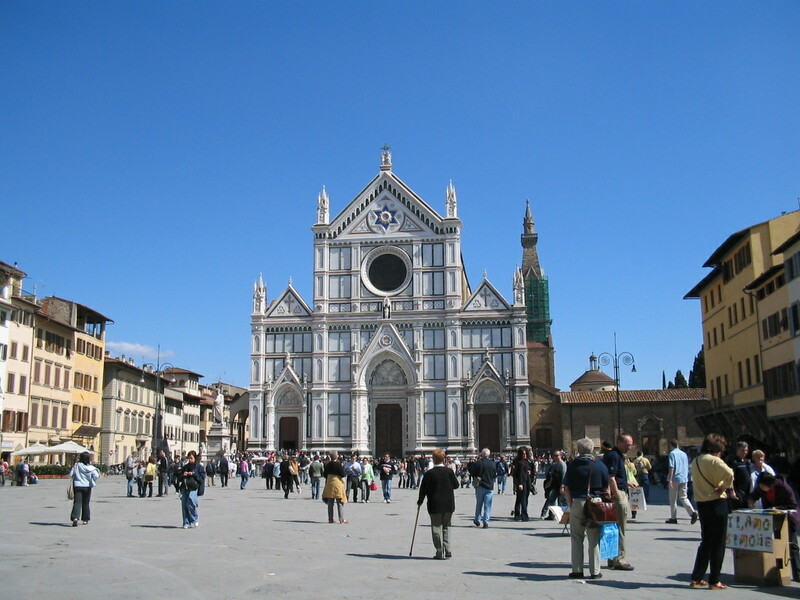 3) Piazza Santa Maria Novella; just outside the railway station, much renovated now and a delightful place to sit in the sun, is home to the church of the same name. The piazza is where they used to hold exciting horse races and the obelisks mark the turning points of the course. The church with its distinctive façade contains more of Florence’s treasures, Ghirlandaio, Lippi, Giotto and Uccello all worked here and you can appreciate their talent in the natural surroundings where they meant you to see them. 4) Piazza Santa Croce is where, since 1544, every June a crazy no holds barred football match has been organised and is also the wonderful setting for the glorious Santa Croce church. Again you can’t miss the art but this is also where Michelangelo, Ghilberti, Machiavelli and Galileo are all buried, while Dante and Fermi are celebrated. The cloisters next door are also where you will find the exquisite Pazzi chapel another Brunelleschi dome. 5) Piazza San Lorenzo is the centre of the bustling open air markets and is a great place to pick up a bargain. Take time, as well, to see the wonders of the church of San Lorenzo, despite its unimpressive façade the interior rewards visitors with a marvellous collection of art. There is also the Medici Library and Palazzo Medici-Riccardi in this great piazza. 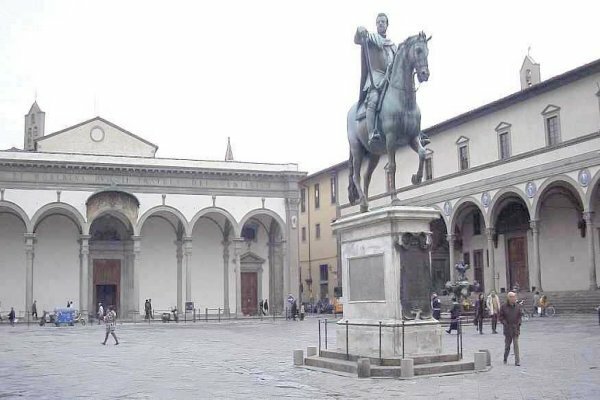 6) Piazza Santissima Annunziata is one of the unspoilt piazzas in Florence, particularly memorable for its strange fountains and impressive statue of the Grand Duke Ferdinand I, the final piece created by the sculptor Giambologna. This square houses the church to the Santissima Annuziata and Europe’s oldest Orphanage, the Hospital to the Innocents, as well as the Museum of Archaeology. 7) Piazza della Republicca was the site of the old market place, sadly all that remains of this vibrant and lively area of Florence is the column with a replica of the statue of Abundance that once graced the original piazza. Redevelopments in the 19th century saw the creation of this large modern square with its richly decorated palaces and elegant shops that now surround the wide open space. 8 ) Piazza San Marco, in the northern districts of Florence’s old town centre is a charming little square punctuated with its church and museum that once echoed to the sounds of a Dominican monastery. 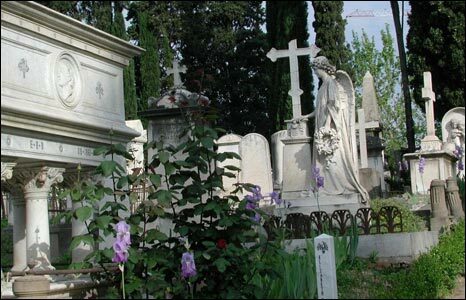 9) Piazza Donetello is another unique location, now surrounded by a four-lane bypass, it was once outside the city gates and where the English Cemetery was built. Now a tranquil and calm location amid the chaos of a modern city carefully tended and restored to its former glory. 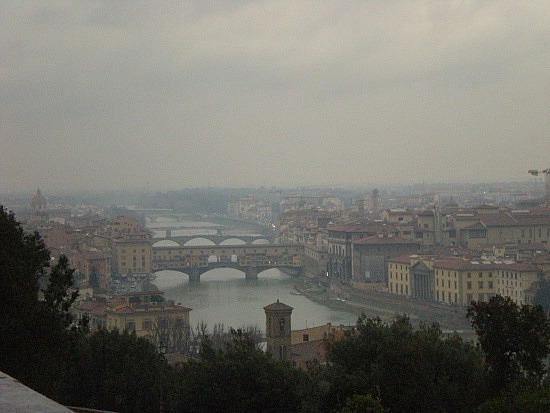 10) Piazzale Michelangelo stands high above Florence and is where you can take wonderful pictures of the city’s panorama. It’s a brisk climb to reach but the sight you are rewarded with is well worth the effort. 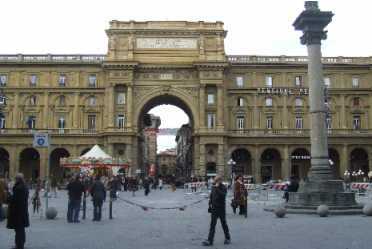 This entry was posted in tours and tagged Florence, Italy, Piazza, tour, Tuscany, vacation. Bookmark the permalink. Love Florence. Very nice collection!